These are very very good. There were no leftovers after dinner. Something is missing though, and I can't figure out what it is. 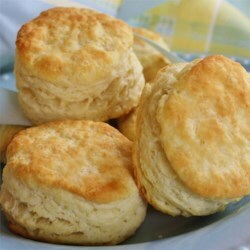 The texture of these biscuits is amazing, and they are very quick and easy to make. I will definitely make these again. Update: I figured it out. It needed less shortening and instead some good old butter. Now they are fully five star worthy.